I recently discovered an article on the excellent blog, LifeHacker, which describes the contents of the CIA’s Escape and Evasion Survival Kit. 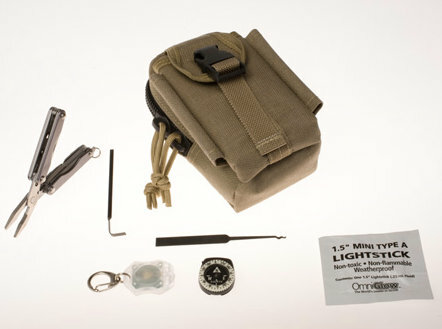 Lifehacker believes the small bag used is the Maxpedition M-2 Waistpack. I like Maxpedition packs: they’re very durable, typically military grade, and reasonably affordable. But the M-2 is small–quite small. This led me to thinking about über-portable shortwave radios I would carry in such a small pack for survival purposes. If I were a foreign operative, ideally, I’d want a shortwave radio that has SSB mode, in case my home country’s numbers station broadcast in SSB. In reality, there are very few good radios that are so compact they could fit in the M-2 Waistpack. A few that came to mind were the Tecsun PL-310ET or Tecsun PL-380, but the fit would be very tight, if at all; both radios are slightly wider and taller than the M2’s main pocket, which measures 5 x 3 x 1.5 inches. I then remembered the Kaito KA1102 that I owned a few years ago–a very portable radio, but it, too, would be too large at 143 x 88 x 28.50 mm. I have never owned an ICF-SW100, but I’d love to. Occasionally they show up on eBay, but prices range from $300-$800 depending on condition. That’s simply too pricey for my budget. Universal Radio has acquired used units in the past on rare occasions; these have sold between $200-400. Then there are the lucky few, like my radio-listener buddy, The Professor. Remarkably, he tracked down (and knows I’ll never forgive him for it) an ICF-SW100 on Craig’s List for about $50! That was a steal. Performance is superb for a radio this size. Not only does it have SSB mode, but selectable sideband sync detection. One note of caution, should you be lucky enough to acquire one: the ribbon cable that connects the lower portion of the radio with the display (especially in the mark 1 production units) is known to fail. Fortunately, there are a number of videos (like this one) which walk you through replacement. Click here to search eBay for a used Sony ICF-SW100. The ICF-SW100 predecessor, the ICF-SW1S (above), would easily fit in the M-2 Waistpack–it measures a mere 4.75 x 2.785 x 1 inches. Like its younger brother, it is highly sought after on the used radio market, and usually fetches $300+. The ICF-SW1S does not have a sync detector and lacks SSB mode. Still, as a broadcast receiver, it is truly superb for its size. If you purchase a used ICF-SW1S, do ask the seller if all 6 original electrolytic capacitors have been replaced. If not, you may have to replace them in short order as the originals were known to fail. While not a repair for the faint of heart (as parts are quite small), there are several instructional sites and videos to help you. Alternatively, you can send your ICF-SW1S to Kiwa to be professionally re-capped. Click here to search eBay for a used Sony ICF-SW1S. Do you know of any other high-quality shortwave portables out there compact enough to fit in the M-2 Waistpack? Let us know! This entry was posted in Articles, Preparedness, Radios, Shortwave Radio, Travel and tagged ICF-SW100, LifeHacker, Maxpedition M-2 Waistpack, Portable Shortwave, Preparedness, Preparedness Radios, Prepper Radios, Sony ICF-SW1S, Survival Kit, über portable shortwave radios on November 2, 2014 by Thomas. I got my Sony icf-sw100 in original box with clip on antenna, no manual but power supply for £15.00 about 2 years ago in a local charity shop , still use it along side my tecsun pl-880 …..it’s just a pity that both radios lack Air band , so I still would use my yaesu vx-2 , no Sideband but a good all rounder ….and small …. You sure got a bargain there! I have a Sony ICF-SW100 its it original box, with instruction book, earpiece and AN71 compact antenna! Airspy or modified RTL-SDR. Small android for SDRsharp. Earbuds. I got a Sony icf-sw1, in a box, containing radio,active antenna,controller only. There are two other accessories missing perhaps one earphone and its round transparent container. It displays all operations but no sound from the speaker. I will try to fix the problem. I used the active antenna with ICF-2001D but like other active antennas, a useless accessory. I’ve found that, with some patience and a willingness to search outside of eBay, that the ICF-SW100 can be found for under $250. It’s more than a fair bit of money for a shortwave receiver. If I had to take a guess at why it has held its value so well it would most likely be down to the amount of performance and features that still exist in a radio so small. It is rather sensitive but even more so with an active external antenna or just a long wire attached to either the external antenna jack or the whip itself. It seems that the size of the whip itself (due to space constraints) limits the sensitivity of the radio. I use mine with a PA0RDT mini whip that I have constructed and the two work well very together. If you add a small outboard filter such as a NEScaf you have an entire station in miniature. The fault with the hinges was only found on the MKI models. The MKII model was released by Sony primarily as a revision to solve the ribbon cable issue. You can tell a MKII from a MKI by looking at the lower right hand corner of the display part of the clamshell. If you see a rectangular shaped notch then it is a MKII. That notch is there for preventing the ribbon cable from being pinched between the two halves when the case is shut. If you’re looking for a radio that is feature laden as well as exceptionally small then the ICF-SW100 is still an excellent choice. I second Ruediger’s mention of the Sony ICF-SW07, I have two of these little beauties and it’s effectively the newer version of the ICF-SW100. Also the SW100 suffered from a bad design flaw by way of the ribbon cable connecting the top and lower section. I got my Sony ICF-SW1S at a garage sale three years ago, only ten dollars. But, I need to open it up, the 5KHz steps are off. It tunes in 10KHz steps, then pads the 10.7MHz to 455KHz conversion oscillator to tune the 5KHz shortwave stations in between. The adjustment is off. The ICF-SW1S even came in the plastic “suitcase”, the active antenna, ac adapter and manual. I remember thinking how neat that all was when it was new and too expensive for me. That was a good day, a few blocks later I got an Eton/Grundig mini 300 receiver for $2.00. Really rather junk, but fun at that price. I have had a Sony ICF-SW1 since the mid 80’s. It came in a system package with an Active antenna/controller, Multi voltage AC Adaptor, earbuds, and handbook in a hard case with strap. At the time I paid around $380 USD for it. Even though as mentioned, it doesn’t have SSB, it has served me well when traveling. BTW, I replaced the caps and changed the green display to a white one a few years ago. I also owned one in the late 90s, and the performance was indeed excellent, and it was also ultra-portable (well, not perhaps enough to fit into the Waistpack!). I was aware of potential problems with the ribbon cable so was very careful with it, but my unit eventually expired due to another fault (can’t remember what! ), and it didn’t last as long as I’d have hoped it would. Still a nice radio though, and good to see a picture of it again. I owned a new Sony ICF-SW100 years ago, and after playing around for a few weeks with it I found it to be quite cumbersome to operate and not such a magical thing of a SW radio as I expected it to be for the price it cost to me. The box itself was quite flimsy and prone to be broken specially the batteries door and the abatable display. The sound of the speaker was like a cricket’s thin and the batteries did not last for very long when used. Eventually I sold it in Ebay many years ago.